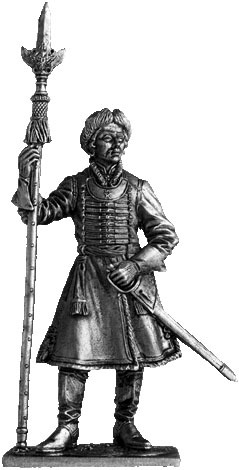 Officer Preobrazhensky regiment 1698-1702 gg. Russia. At the end of 1698 by decree of Peter I as the official uniforms were installed "Hungarian coats." Already in January 1699 in Epiphany parade all the officers of the Preobrazhensky Regiment were in dark green Hungarian coats with fur with gold buttons and buttonholes. Hats were made of beaver or fox fur. Top hat covered in red velvet. On her feet red morocco boots or stockings with shoes. Gloves with yellow funnels of elk skin. Sword with a gold-plated or silver hilt sword belt worn on the waist, which was made of unpainted skin and could be covered with colored cloth or velvet and surrounded by gold or silver lace. The belt scarf of red silk with golden tassels. Ranking officer was a partisan weapon with a red silk with a brush on a pole, painted in red or black. From 1698 to 1701 officers of the Guards wore the badge of a crescent with truncated ends. At the senior officers of the signs were silver with a gold St. Andrew's cross under a crown and worn on the blue ribbon of St. Andrew. The chief officers were called initial company-level people (captain, lieutenant and ensign). The king himself was listed as Captain Peter A. bombardier company Preobrazhensky Regiment. Chief officer wore his uniform at Preobrazhensky these years, and Alexander Danilovich Menshikov. Formed in 1691-92 years of "failed amusing people of all ranks," Preobrazhensky and the Semenov regiment were originally third elective Moscow Regiment Avtomon Mikhailovich Golovin. Preobrazhensky soldiers who formed the first "thousand" of the regiment, received a green caftan, and Semenov, who formed the second "thousand" - blue. In 1693 Preobrazhensky and the Semenov regiment finally constructed, trained and he named the soldier. Officers, or the initial people who appoint an experienced, knowledgeable foreign military affairs. Together with the Russian army finally established themselves and military officers: Colonel, polupolkovnik (assistant Colonel), Major (Battalion Commander from 1698), captain (company commander), Lieutenant (Officer for orders, assistant to the captain), Ensign (bearer) . Already in 1694 to chief officer positions were appointed by Russian officers, both of noble families, and from the ordinary, not the noblest. In 1695-96 gg. Preobrazhensky and the Semenov regiment were the first combat experience under the walls of Azov. Notify me of updates to Officer Preobrazhensky regiment 1698-1702. Russia.